The Bowflex E116 BXE116 Elliptical Trainer is a high performing elliptical machine similar to the Bowflex’s top-of-the-range E216 but with a slightly lighter flywheel at 30 lbs (instead of 35 lbs) and not quite as many resistance levels and programs as the E216 (20 resistance levels instead of 25 and 9 programs instead of 11). 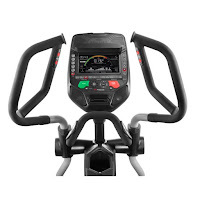 Like the E216, the Bowflex E116 is sturdily built and designed with ergonomic comforts and some high-end features to keep your workouts motivating. The Bowflex E116 Elliptical Trainer utilizes a 30 lb flywheel and magnetic resistance for smooth and quiet operation. There are 20 resistance levels to keep you challenged, 9 programs to choose from to keep your workouts varied, and up to 10% motorized incline to activate more muscle groups. The Bowflex E116 Elliptical Trainer offers a 22” stride length (precision path) and features Switch Select Cushioning System on the pedals which provides low-impact cushioning along with adjustable pedal tilt for comfortable positioning and best ergonomics. 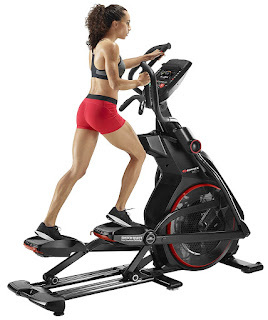 The Bowflex E116 BXE116 Elliptical Trainer comes with a premium Burn Rate Console that’s easy to use and easy to view. It features a large 7.5” LED color backlit screen which displays motivating workout stats including time, speed, distance, calories (the Burn Rate console allows you to see total calories burned every minute) and heart rate (heart rate is measured via built-in pulse sensors or via a wireless chest strap). The console allows for up to 4 user profiles so 4 different people can use the elliptical machine on a regular basis and keep track of their workout stats. In addition, the console is Bluetooth compatible so you can sync it with the Bowflex Free Results Series App for online fitness tracking (compatible with both iOS and Android devices). 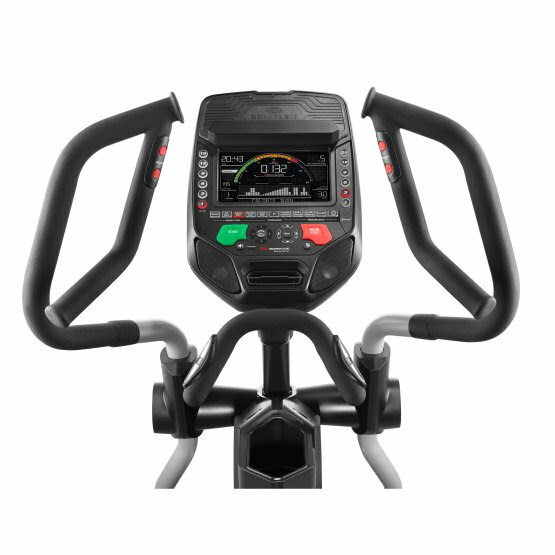 The Bowflex E116 Elliptical Trainer’s moving handlebars are ergonomically designed with multi-position grips, allowing you to find the most comfortable grip position and also allows you to work different muscles depending on hand placement. The moving handlebars also feature convenient In-Reach controls. Additional features of the Bowflex E116 BXE116 Elliptical Trainer include dual speakers with MP3 input, built-in media shelf/device holder, USB charger port, and a handy water bottle holder. Sturdily built with a durable steel frame, the Bowflex E116 allows for an extended user weight capacity of up to 400 lbs. *Prices/discount/shipping indicated correct at time of writing/publishing and may be subject to change anytime. E&OE.